Mexican banks, determined to avoid a return to past woes, are reining in lending to the country’s indebted state governments, some of whose leaders have recently become the focus of corruption allegations, according to Reuters. The drop in bank lending to the states this year has been the sharpest since the 2007-2009 financial crisis, and coincides with a jump in liabilities in several states in the past five years. In the first half of 2016, commercial banks agreed 11 loans to local and state governments worth 8.471 billion pesos ($451 million), less than half the sum from the same period in 2015, when 32 loans went out, according to finance ministry figures. This year’s decline was the steepest since 2009, when the financial crisis pushed Mexico into recession, the data show. Four states – Veracruz, Quintana Roo, Nuevo Leon and Chihuahua – accounted for close to half of the 70 percent jump in local government liabilities between 2010 and 2015, which stood at 536 billion pesos ($28.52 billion) at the end of December. “We now have more cautious policies to avoid cases of over-indebtedness,” said Armando Acevedo, the executive in charge of local lending at Grupo Financiero Interacciones, a major lender to states and municipalities. And over the next six weeks, Moody’s did the same to Veracruz and Chihuahua, while Quintana Roo, home to tourist hub Cancun, had its outlook lowered by Standard & Poor’s. Mexico has suffered two major financial crises in recent decades – in 1982 following a national default and in 1994-1995, which was accompanied by a sharp currency devaluation. The Mexican government insists there is no problem, and a law passed in April means lending rules are now tighter. Banks insist they are not retreating from regional borrowers, which are dominated by the 31 states and Mexico City. “What we have done is be much more careful about which states we’re lending to,” said Luis Robles Miaja, board president of BBVA Bancomer in Mexico. Another top Mexican financier, speaking on condition of anonymity, told Reuters that he was seriously concerned about corruption and financial mismanagement in states including Veracruz, and had sought to reduce his exposure. Signs of retrenchment are evident. Between December 2015 and June 2016, commercial banks’ total outstanding loans among states and municipalities dropped 3.1 percent to 324.3 billion pesos, according to central bank figures. In contrast, their loans to the private sector rose 5.6 percent to 3.477 trillion pesos. Local governments account for a small fraction of total liabilities, but allegations of corruption have been punished by voters in the four states at the center of debt concerns. 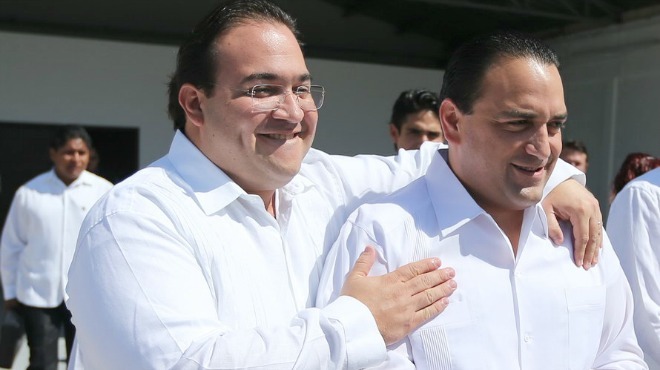 Ruled by President Enrique Pena Nieto’s PRI going into 2015, Veracruz, Quintana Roo, Nuevo Leon and Chihuahua have all since fallen to the opposition, which has accused the outgoing governors of fraud or embezzlement. They deny the allegations. There are even fears some states could need a bailout. “Veracruz is broke,” said Armando Rios Piter, senior member of the Senate finance committee in the center-left opposition Party of the Democratic Revolution, which captured the state in coalition with the center-right National Action Party in June.